The enteric nervous system of jawed vertebrates arises primarily from vagal neural crest cells that migrate to the foregut and subsequently colonize and innervate the entire gastrointestinal tract. 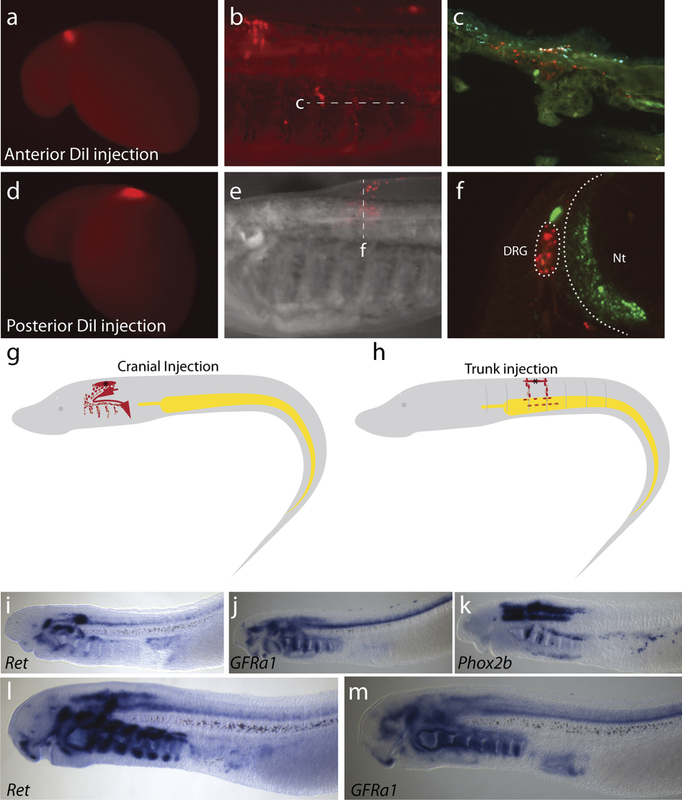 Here we examine development of the enteric nervous system in the basal jawless vertebrate the sea lamprey (Petromyzon marinus) to gain insight into its evolutionary origin. Surprisingly, we find no evidence for the existence of a vagally derived enteric neural crest population in the lamprey. 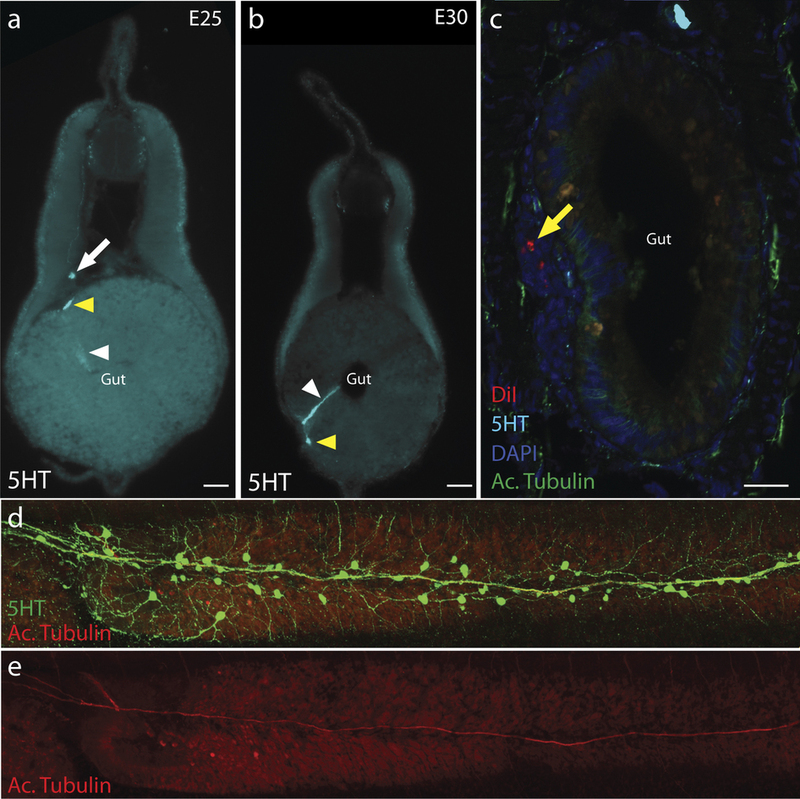 Rather, labelling with the lipophilic dye DiI shows that late-migrating cells, originating from the trunk neural tube and associated with nerve fibres, differentiate into neurons within the gut wall and typhlosole. We propose that these trunk-derived neural crest cells may be homologous to Schwann cell precursors, recently shown in mammalian embryos to populate post-embryonic parasympathetic ganglia, including enteric ganglia. Our results suggest that neural-crest-derived Schwann cell precursors made an important contribution to the ancient enteric nervous system of early jawless vertebrates, a role that was largely subsumed by vagal neural crest cells in early gnathostomes. © 2017 Macmillan Publishers Limited. received 23 February 2016; accepted 31 January 2017. Published online 20 March 2017. We thank C. Baker, M. Piacentino, and L. Kerosuo for discussion, and M. Martik, M. Simoes-Costa, and R. Uribe for their comments on this manuscript. These authors contributed equally to this work: Stephen A. Green & Benjamin R. Uy. Author Contributions: The project was conceived by M.E.B., and analyses were designed by S.A.G. and M.E.B. Descriptive analyses of enteric neurons were performed by S.A.G. Cranial DiI labelling was performed by B.R.U., M.E.B., and S.A.G. Trunk DiI labelling was performed by B.R.U., S.A.G. and M.E.B. Surgeries were performed, imaged and analysed by S.A.G. and B.R.U. Schematics were drawn by S.A.G. The manuscript was written by M.E.B., S.A.G. and B.R.U. Data availability: The datasets generated during and/or analysed during the current study are available from the corresponding author upon reasonable request. The authors declare no competing financial interests.